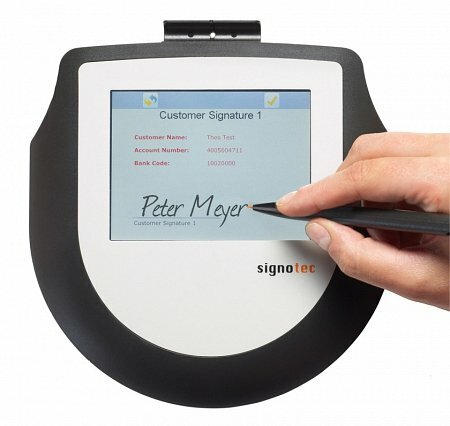 The Signotec LCD signature pad “Omega” is the big brother of the successful “Sigma“. 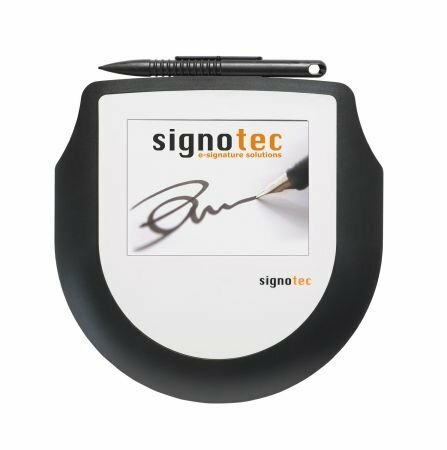 A signature capture device “Made in Germany” fully developed and produced by Signotec with an unparalleled price/performance ratio. With outside dimensions of 180 x 191 x 15 mm it is extremely compact with an especially appealing design. This device allows you to set clear trends at your POS. 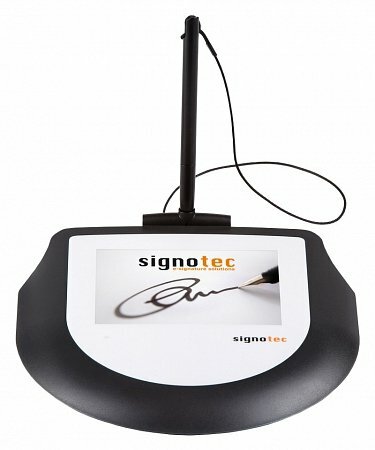 The powerful signature pad captivates with a flat surface without edges between sensor and case, for ultra-ergonomic signing. Pen and sensor convey a feeling similar to writing on paper. Plus, the rounded sides allow the heel of the hand to transition smoothly from signature tablet to table, without disrupting the signing process. The pen itself has the size and feel of an actual ballpoint pen and works entirely without electronics and power supply. Replacing the passive pen is inexpensive and the pad can continue to be used if the pen is lost. The outside of the Omega can be customised to meet the customer’s wishes, in any colour, and even be imprinted with the customers logo. Data transmission from pad to PC is secured, preventing biometric characteristics from being intercepted. Developing the electronics, firmware, driver and applications ourselves allows for optimal coordination of hardware and software. Particular emphasis should be given to the 10 freely programmable memory spaces on the pad where recurring content can be permanently stored. This results in an enormous speed benefit for the graphics layout as these are not repeatedly loaded onto the pad but instead simply retrieved. This large internal storage can also be used for slide shows. Graphics can be permanently stored on the pad. You determine the display sequence and duration. The slide show runs independently, without connection to the software. Simply plug into a USB port and you’re ready. Memory Internal memory for 10 pictures which can be used for static content (fast switching between different pages) and slide shows.